Dacă încă mai asociați din punct de vedere muzical Mexicul cu o gașcă de mariachi soioși, iată că a venit momentul să ne scuturăm de clișee! Talentul și apetitul enorm pentru muzica electronică de calitate l-au aruncat pe Hector din micul său DJ booth din Guadalajara (orașul natal) direct pe scena unor festivaluri de calibru: Time Warp, Sunwaves, BPM sau Hideout. Luat sub aripa protectoare a lui Loco Dice la Desolat, Hector a înflorit numaidecât, luând prin suprindere publicul înfometat după petreceri legendare. De aici și până la propriul party brand, Vatos Locos, nu a mai fost decât un pas. Am profitat de massive party-ul de la Kristal Glam Club din 21 februarie (Guti & Hector) și l-am luat pe Hector la întrebări despre conceptul Vatos Locos! Hit us with a bit of history for the Vatos Locos name. How did you stick with this name? Vatos Locos is a slang from Mexico, years ago was one of the biggest gangs in America. You can tell Vato is the mexican equivalent for mate in UK. Dubfire and Dice kept calling me “What’s up, Vato! Hey, Vato Loco”… this name followed me everywhere I went. So one day I decided to make a Vatos Locos t-shirt and from there everyone went crazy about it, asking whether it’s a label or a party. I had no answer! Even I didn’t know what it was until BPM Festival where we decided to make a little party: just my friends, no big names in the lineup… just give something back to the people that offered support! Do we talk about a specfic sound for the Vatos Locos parties? Nope. We focus on the music but there is no limitations on the sound. In Miami we will have Joeski and Harry Choo Choo Romero, they’re actually 2 of the pioneers of house music, so real old skool stuff. Also I’m inviting my boys David Gtronic, Chad Andrew and Javier Carballo so it’s going to be a mixture of styles but all QUALITY MUSIC! 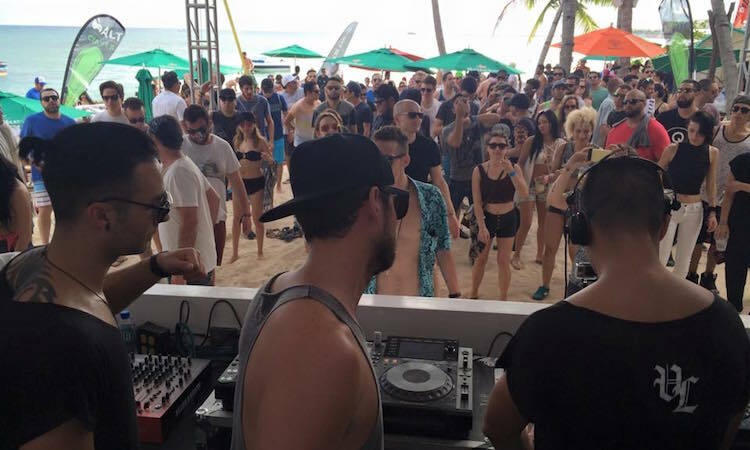 The location is very important: for example at BPM we had a very intimate beach party at Canibal Royal! At Miami WMC we are going to play mostly vinyl in a very very very small venue, Do Not Sit On The Furniture: no more 150 people and a great soundsystem, totally different than you’d see in Miami. Next stop is Detroit Movement and after that we’re coming to Europe at Sonar Barcelona. Cool vibes, small venues, people coming for the music, this is what we do! We heard that Vatos Locos attract a lot of good looking chicks. Is it true? This track on Desolat, called Sisters, I played it right at the end of my BPM set and everyone on the dancefloor went crazy for this house vibe with cool vocals!